Factors to Consider – Is it right for you? LED lanterns have completely replaced traditional lanterns. Their convenience, portability, and several uses are unbeatable. It is as a result of this rising popularity that there are several options with many confusing specifications. 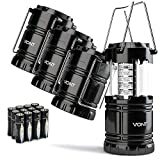 In reviewing of the best outdoor LED camping lanterns below, I have minimized the work you would have had to do going through the multitude of options only to end up with one of these. As each lantern is best suited for a particular function, I have included a short guide on what to consider to make the right selection depending on your needs. 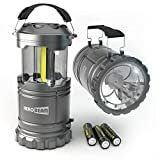 As Amazon’s, and our, pick for best LED camping lantern, there is a lot to say about this lantern. First, it comes with a simple design that does away with most of the features for a simple, and direct operation. Instead of an on/off button, you just push it down and it switches off, folding into a compact storage size. This folding mechanism allows you to dim the lights when the need arises. Vont has two large handles at the top to help you move it around easily. It is made of military grade material that feels sturdy and won’t crack easily. You need three AA batteries to operate, but they aren’t included in the package. It is very bright, using 30 premium bulbs with each having over 20000 hours of life. The company guarantees us that it is a good purchase by offering ten years warranty. The design of the Coleman Quad LED lantern is what places it among the best. You can think of it as a charging base with four detachable LED light panels. These panels are pretty bright, each emitting 47.5 lumens for a maximum of a one-and-a-half hour. You can also use the lantern with each panel attached to the base. You get about 190 lumens for eight hours. With the detachable panels, everyone can take one into their tents and use them safely. This is so as they make use of diffused lenses to minimize glare, and they never get hot. What’s more, they will never need replacement. You need 8 D-cell batteries to power it. The Quad LED lantern is on the larger side of lanterns so it is not suitable if you have space constraints. 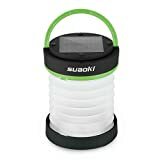 If you are looking for a portable hand lantern that gives you several brightness options, this might be the one for you. It has a maximum brightness of 540 lumens, and five different light settings: red flashing, red, low, medium, and high. Its ergonomic design lets you detract the handle when not in use. Despite this brightness, Streamlight 44931 has a battery of over 290 hours on low setting. You will really appreciate how rugged the construction of the Streamlight is. It is tested to withstands falls of up to 2 meters on concrete. This is made possible by the use of polycarbonate lens in the removable outer globe. It has a water resistant rating of IPX7 so there is no chance of it getting spoilt when dropped in water. You need 3xD batteries to power it. They are not included in the package. The best part about it is the battery level indicator at the front to let you know when you are about to need spares. The 30-day LED lantern by Ultimate Survival Technologies makes it to this list because of its very long battery life. On a full battery and low setting, you can get up to 30 days out of this bad body. On high, the battery will last 22 hours and 106 hours on medium settings. It lights using three LED bulbs that will never need replacement. Besides the standard lighting modes, you also get the SOS mode that produces flashes as emergency lights. It is powered by three D batteries that are not included in the package. Also, it is tough, and the rubber housing allows it to withstand the most rugged use without sustaining damage. It is not very compact but, with a weight of just over 1 pound, you can carry it around with ease. As an update to a product that almost every user had something positive to say about, the HeroBeam LED lantern V2.0 is definitely worth a buy. It comes as a single unit or as a pair, eliminating the need to buy extra light sources. Each of these camping lanterns has a brightness of 300 lumens and light an entire 360 degrees. They make use of the latest LED light technology, COB LED to produce twice the brightness at half the power. This lantern does away with the light switch so you won’t fumble around in the dark anymore. You just lift up the top part using the handle to turn it on and push it back down to switch off. There are no glass components so the HeroBeam v2.0 can very well hold up to wear and tear. The collapsing design not only makes it compact for storage, but it also adds an extra layer of protection to the lighting components. 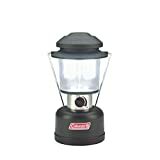 It is usable as an emergency or a camping lantern thanks to the strobe and brightness it offers. This lantern runs on three AA batteries. This list would not have been complete without mentioning Gold Armour. 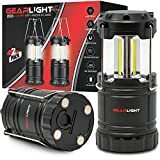 They boast that this LED lantern is among the best and most reliable for its size, and it is impossible to argue with that judging by the number of satisfied customers. You feel confident this is a good buy when you see the 15-year warranty attached to it. It comes as a convenient pack of 4 at a fraction of the price you would pay for other models. They have varying colors, and three AAA batteries for each lantern are included. Each unit in the 4 pack has 30 low power consumption LED light bulbs to give a brightness of 135 lumens. The material used is ABS plastic, which is reinforced to make it weather resistant. Mores, It folds down for compact storage, convenient way to turn on/off, reduce brightness, and as a way of providing an extra layer of protection to the lighting transparent part. The highlight of the Coleman Twin LED lantern is in its wide range of brightness settings. It comes with an intuitive dial at the front that lets you control its brightness from ultra-low to very high. With this, it makes the perfect outdoor as well as the indoor companion as you can reduce the glare completely. At its brightest settings, it emits 390 lumens for a distance of 32 feet and can run for up to 85 hours. Its lowest brightness emits 100 lumens for 19 feet and can run for up to 299 hours. It is powered by eight D batteries that aren’t included in the package. The company covers your purchase with a five-year warranty. The Suaoki LED camping lantern has a nice design that can easily be mistaken for something else. It also folds down to the most compact size in all the items in this guide so it is best for small storage spaces. This makes it usable in a number of settings such as biking, hiking, camping and fishing among others. It features a solar panel at the top, singling it out from the rest. This panel acts an alternative method to charge it using a USB cable and is a lifesaver when you are out in the woods without access to electricity. The best part about it is it doubles up as a power bank so you can use it to charge your devices. Suaoki LED light has three lighting modes that make it also usable as an emergency lantern. It won’t overcharge or overheat thanks to the inclusion of a protection chip so you are guaranteed of safety while using it. The Letmy camping lantern has a sleek design and grey in color, giving it a premium look and feel. This ergonomic design features a magnetic base for convenient storage and detachable hands to take as little space as possible. It has a simple on/off mechanism, requiring you to only push the top part down or pull it up. 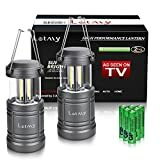 LETMY 2-pack camping lantern has only one brightness setting of 500 lumens, making it a perfect camping lantern. The use of COB LEDs increases the lifespan of the lights and the brightness without messing with the battery life. You can also use it as a tabletop reading lantern as you can minimize the level of brightness. The ABS plastic used means it won’t crack or get damaged anytime soon. It has a water resistant rating of IPX5, so it can only withstand rain and running water. It will get damaged if submerged for long. The package includes 6 AA batteries to kick you off. It goes up to 12 hours on a single set of batteries and comes with a two-year warranty. At two for the price of one, the GearLight LED lantern finds the perfect way to kill two birds with one stone. You won’t need any other light sources once you have this pair. Don’t be fooled by the price though, as each of the units is powerful and features the cob LED design that gives out much more light than the typical 30 LED lights. It is powered by three AA batteries and has a battery life of up to 12 hours on high settings. They both have a collapsible design to take as little space in the luggage as possible. This collapsible design allows you to reduce the brightness of the lights as you push it down. To switch it off, you push it down completely. You can use it as emergency lights, fishing, camping and hiking among others. This is true as its exterior plastic shell can withstand a lot of abuse. The back end has a recessed hook and magnets to assist is storage at whatever angle. Just when you think you have seen it all, something else, a design will surprise you. This rechargeable LED camping lantern by Lighting EVER is interesting in design. The lighting area is divided into four parts, with two being permanent light panels, and the other two being detachable torches. Each torch has a brightness of 20 lumens so they are very handy in small spaces or as night lights. It reaches a maximum of 200 lumens. Also, it’s sturdy build makes it capable of withstanding even the most aggressive use. Plus, its selling point is the power options it offers. You can either use the 1800 mAh battery built in, which you will charge using a USB cable, or three D batteries. This makes it usable in a number of settings: especially if you factor in the built-in compass. The package includes a car charger, USB cable, and three AAA batteries to power the flashlights. The compass is useful during hunts. The highlight of this lantern, as you may have guessed, is the presence of a fan for one of those hot camping days. Its inclusion is a nice pretty nice touch and produces a surprisingly strong breeze. The fan adds very little to the weight of this lantern. It comes weighing about 1.2 pounds. This, together with the handle at the back end simplify moving it around. There is also a hook at the end to hang it at the roof when you are using it; either as a fan or a lamp. It has a battery life of 37 hours when using it as a lamp, and about 15 hours of a low-speed fan. The 18 bulbs are very bright and can be used either inside or outside your tent. You can point the fan and the light in two opposite directions. Yosoo camping lantern is one of the most convenient and versatile units we have in this guide. It has a unique design and shape, coated with rubber to prevent slippages. The carrying handle at the top is retractable to keep it out of the way. With a weight of 15.2 ounces, you can carry it around with relative ease. Apart from performing the normal functions of a camping lantern, the Yosoo double up as a power bank. It has an output port, and the package includes a USB cable so you can use it to charge your phone. Yosoo has two light modes: strobe and SOS, and three levels of brightness: low, medium and high. Each level of brightness and mode has varying battery life with the low going for up to 280 hours. It uses a 13000 mAh battery to power its ultra bright LEDs. The level of brightness you go for is determined by your intended use. 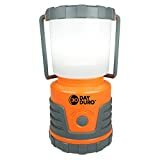 If you want an emergency lantern, or something you can use outside, a very bright lantern is warranted. If you want something for use inside the tent or to read with, a few lumens will do. There are some lanterns that offer a wide range of brightness options. These are better if you have multiple uses for your lantern. LED lanterns that offer a variety of lighting modes are much more convenient and economical than those that don’t. Most come with the standard high, medium and low modes. Others go an extra step and include night vision to help you see well at night and SOS mode for emergency lights. Some of them even go a step further and integrate removable panels and flashlights for use by more than one person. This is arguably the most important aspect to consider as most of these lights are used in areas and situations where there is no way to charge them. Whatever the intended use, this is an important consideration. There are some lanterns that offer alternative methods of charging such as solar panels. These are the most appropriate for situations where you won’t be around a power outlet for long. LED lanterns should take minimal storage space and add little to no weight. This is so as they are mostly used for hikes and adventures. The ideal lantern should have a compact size for convenient transport and storage and have handles to move around easily when in use. No matter the convenience that it offers, or how bright the light it produces is, all that is in vain if it is weak and prone to damage. You are going to use it mostly outdoors, and it may get pretty aggressive at times. That said, you should go for LED lanterns that have a finish that promises durability and reliability. It should be able to withstand drops and other things such as water exposure. The LED lanterns have risen in popularity because of their brightness, dependability, and fast operation. They are very handy in a lot of situations that include lighting up a campsite and getting backlight in your house in case of a blackout. There are many brands and options to pick from to enjoy these benefits. Hopefully, this guide has equipped you with all the relevant information (and then some) to accurately discover the LED lantern for you.